Battle of the Denmark Strait, May 24, 1941. German battleship KMS Bismarck firing on HMS Prince of Wales, as seen from the heavy cruiser Prinz Eugen, which is steaming ahead of Bismarck. At dawn, the German battleship KMS Bismarck and cruiser KMS Prinz Eugen steamed southwesterly through the Denmark Strait, shadowed by the British heavy cruisers HMS Suffolk and HMS Norfolk. Shortly before 0600 Hours, Prinz Eugen, which was ahead of Bismarck, sighted ships to the southeast. These were the Royal Navy's battlecruiser HMS Hood, and battleship HMS Prince of Wales, a new ship that still had civilian workers aboard during her shakedown cruise. The British soon opened fire with their forward turrets, while rapidly closing the range. Hood initially fired her 15" guns at Prinz Eugen. Prince of Wales, which carried 14" guns, shot at Bismarck. Neither made hits. As the British began a turn to bring their after turrets to bear, the two Germans opened fire at Hood. Bismarck's 15" guns, and the much smaller 8" guns of Prinz Eugen, soon found the range. Fire broke out amidships on Hood, and at 0601, immediately after Bismarck's fourth salvo arrived, Hood's after ammunition magazines exploded. Her bow rose as her shattered after hull filled with water, and she was soon gone, leaving but three survivors of her crew of over 1400 officers and men. The Germans shifted fire to Prince of Wales, making three 15" and four 8" hits that seriously damaged the British ship. She was troubled throughout the action by gun functioning problems, but still managed to hit Bismarck with three shells before her own damage forced her to turn away and break off the battle. One of the three British 14" projectiles hit Bismarck's hull forward, flooding some of the German ship's bow compartments. Another hit low and amidships, bringing more water into the ship. This damage, though hardly vital, left Bismarck listing to port, down at the bow and unable to use all her oil fuel. Her maximum speed, seakeeping ability and range were all reduced, and she was now leaving an oil slick in her wake. The third shell, which struck high and amidships, made it impossible for Bismarck to launch her floatplane. 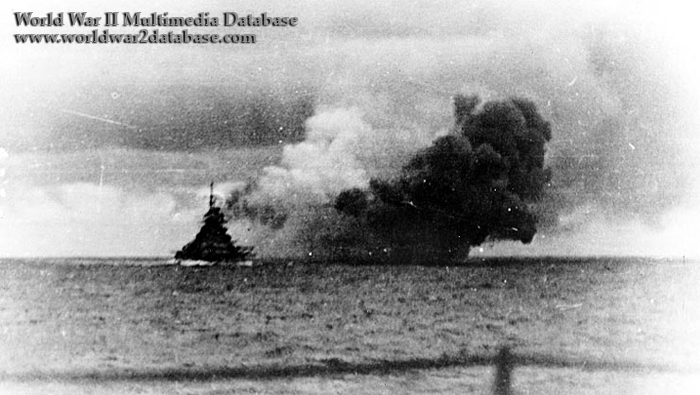 The Battle of the Denmark Strait, which lasted only about seventeen minutes, caused the Germans to terminate Bismarck's sortie. After parting ways with Prinz Eugen later in the day, she turned southeast, toward France. The British, who already had sufficient cause to want Bismarck eliminated, now had an additional motive: revenge for the tragic loss of Hood and nearly all of her crew.